​The Iris Quadcopter is a high-quality device from 3DRobotics. 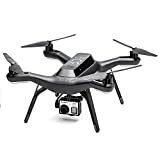 It is designed so that users can attach a GoPro camera to capture stunning aerial footage. If you’ve gained experience flying drones, you may be looking to upgrade your equipment. One of the options you may come across when attempting to do so is the 3DR Iris Quadcopter. This drove is a high-quality device from 3DRobotics. The company designed the drone so that users can attach a GoPro and gimbal device. Below, you’ll find everything you need to know about the 3DR Iris Quadcopter. What is the 3DR Iris and How Does It Work? What Makes the 3DR Iris Unique? The 3DR Iris is an autonomous aerial vehicle that is designed to meet all of your in-flight needs. Chris Anderson, who served as editor-in-chief of WIRED Magazine, helped co-design the machine. The product weighs 8.8 pounds, which is a bit more expensive than other drones. However, this is primarily for two reasons. One, the drone comes with a piece that allows users to attach a camera. Second is the fact that the 3DR comes with a payload capacity of approximately 400 grams, meaning users can transport smaller goods in the sky. The 3DR product comes with 16 – 22 minutes of flight time. The flight time depends on how much maneuvering you do while flying and the weight of the payload that you are carrying during your flight. The battery takes no more than an hour to charge. There’s no denying that the 3DR stands out because of its ability to stream and capture footage. It’s easy for users to attach cameras to their drone and then view this footage by using applications on their cell phone or tablet. For those looking to use their drone not as a toy to fly, but as a machine that can capture stunning aerial views, you may want to consider this product from 3DR strongly. There are a few aspects of the 3DR that helps set it apart from other drones. First and foremost is the drone’s “Follow Me” technology. To use this feature, you’ll also need an Android device that is GPS-enabled. The drone will follow the GPS feature automatically. No matter if you’re hiking a new trail or biking a rocky path, Follow Me provides users with a personal camera operator. Similarly, the stabilization capability on the Iris device is exceptional. No matter if you are looking to capture still photographs or fast-paced videos, you’re likely to find that you’ll find crystal-clear footage. Additionally, the Iris comes with an auto-mission mode. Here, users can map their flight path beforehand their drone takes flight. They can do so by using the company’s Missing Planning app. This could be critical if you are in the middle of a journey and are concerned about what stands ahead. You can trace the path on a map. Your drone will then fly this route automatically and return to you with valuable footage. The machine also comes with Flight Protection in case the battery begins to run low. When the device is low on battery, it will land itself automatically, avoiding a violent crash. Lastly, if you would instead view your footage in real-time, you can do so thanks to the drone’s LiveView feature. Thanks to integrated software from 3DR, users can live-stream a video feed of their drone. We found that assembling this kit, which comes with a seven-inch monitor and a 5.8 GHz wireless receiver is easy to do, taking a mere few minutes. The Iris drone is for those looking to maximize their experience with quadcopters, and its price is reflective of this. According to the 3DR website, NorthOx has taken over their inventory. Thus, NorthOx is now the official distributor of Iris drones. You can find the drone on the NorthOx website for $$$. The product is currently marked down from its previous price of $$$. Potential customers may also be able to purchase the drone from a third-party website. For example, they could potentially find the units on eBay or other similar sites. Additionally, Amazon sold the Iris device at one point in time, although they are currently out of stock. It’s unclear how much the drone cost when it was available on Amazon. 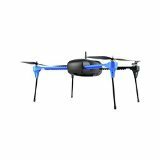 When browsing reviews online, it appears that customers thought of the Iris drone very favorably. For example, the product has a 3.8-star rating on Amazon with more than 60 customer reviews. Of those who review the product, 75 percent gave it either a four or five-star rating. Many of the poor reviews came from users who had purchased used versions of the Iris. Many customers found that it was effortless to fly this device. Some said that this was the first drone that they had ever owned and they discovered that it was straightforward to maneuver. Many customers also recommended adding a Gimbal device if users planned to use a GoPro or other similar camera, as this helped stabilize the picture. Another thing that stood out to customers was the fact that the 3DR brand is so reputable. 3DR is known to provide the latest in mapping and surveillance technology, which shows in the Iris’ design and features. Additionally, customers appreciated the fact that there was so much support available online to help with troubleshooting. Customers remarked that the device was ready to fly upon purchasing. However, some noted that they needed to recalibrate a few aspects of the drone after its first flight. The accelerometer and the compass were the features that most needed to be adjusted. Users found that by entering the Mission Planner application and running through the “Initial Setup” tab helped solve their problems. Lastly, customers found that even with a price tag of around $$$, they still received incredible value for this product. That’s because other products that offer similar features can cost as much as $$$$. Many reviews noted that they could not believe they were able to access such impressive design features for a mere fraction of the cost of other high-quality drones. If you’re searching for a drone that allows you to capture amazing aerial footage, there are a few options that you may come across. Two of the most popular alternatives are the Phantom 3 and the Solo. Below, you’ll find a breakdown of the two choices and how they stack up compared to the 3DR drone. The Phantom 3 from DJI is similar to the Iris in that both drones are ready to fly, with GPS capabilities, out of the box. The Phantom 3 features a 4.2-star rating on Amazon with nearly 1,200 customer reviews. Of those who reviewed the product, more than 65 percent gave it a five-star rating. You can purchase the product for about $$$, although this only includes the cost of the quadcopter itself. The Phantom 3 does not come with a “Follow Me” feature like the Iris. Although the GPS features of the Phantom 3 are stable, users must rely on the DJI Pilot App, which puts the device entirely in users’ hands. In addition to having control of the drone, users also have complete control of their camera through this app. That’s primarily because the Phantom 3 comes with a built-in camera. This is the most significant difference between the Phantom 3 and the Iris. Users must attach an external GoPro to the Iris if they wish to capture footage. The Phantom 3, on the other hand, comes with a built-in camera that can capture 12-megapixel images in addition to 4K video at a rate of 30 frames per second. The Solo drone is another piece of equipment from 3DR. The 3DR Solo is available for $$$, making it a cheaper option than the Iris. However, it appears that users only have the option of purchasing used devices on Amazon or factory-refurbished devices from NorthOx. However, when buying on NorthOx, customers will receive a free gimbal, backpack, and battery for free. This marks one of the most significant differences between the 3DR products, as users may find that they receive much more valuable when purchasing the Solo model. The Solo is lighter than the Iris, which allows it to have a maximum speed of 55 miles per hour, compared to the Iris’ 40 miles per hour. The Solo device also has double the payload capacity than the Iris. Unfortunately, however, many users report that there are stability issues when using the Solo device. They find that the machine drifts even after they have stopped it, which impacts the quality of their photos. Many users find that this is because of the device’s GPS. Users don’t report this issue nearly as often when using the Iris device. Additionally, the Solo operate on a 2.4GHz frequency, which is about half the frequency of the Iris model. If you plan to fly the device in an open field, this may not be of particular concern. But if you are operating in a city, where there could be significant interference, you may have more problems with the Solo drone than with the Iris drone. There’s no denying that the Iris Quadcopter is a serious piece of equipment. Our testers were very much impressed with the specs of the hardware and the features that helped enhance the user experience. The drone’s design stood out to us as soon as we removed it from the box. We were impressed by its sleek design. The GPS capabilities of the product stood out to us the most. The “Follow Me” feature and the videos we captured while doing so were incredible. The GPS on the Iris was some of the best we have seen in a drone, as is one of the most prominent features of the device. We also found that the app was easy to navigate on our smartphones and tablets. Even though it’s easy for beginners to use this product, we do not necessarily recommend it for beginners because of the price tag. Users should confirm that they not only know how to fly a drone but will use many of the product’s features. $$$ is a considerable investment for a piece of equipment. Plus, this does not even account for the fact that users will need to purchase a gimbal and GoPro. If customers know that they are going to use the in-flight camera option, they should strongly consider how they will be using the drone. For example, if you are on a hike, you may find it beneficial to use the drone to capture the land ahead of you and then use a GoPro for photos and images from the first-person point of view. If this is the case, it may be counterproductive to purchase a drone with a built-in camera, such as the Phantom 3, since customers will then carry a GoPro with them as well. Many customers appreciate the fact that they can attach and detach the GoPro from their Iris device quickly. Ultimately, the fact that the Iris features a dismountable camera could be beneficial for some and not so for others. Similarly, users should consider their purpose for the drone when weighing between options like the Iris and the Solo. If users feel as though they are going to move around frequently, choosing a product with a quality GPS system could be of significant benefit. However, if customers are merely looking to capture aerial overviews while stationary, the Solo could be a better choice. We were quite satisfied with the Iris from 3DR and would recommend it to customers looking for stunning aerial images, especially if they will not need to purchase a GoPro. Although customers may be able to find products that are cheaper or with a slightly better design, the Iris seems to do well in every category, making it an excellent all-around option.